I’ve always loved all kinds of egg rolls from a variety of cultural cuisines from Filipino lumpia to Chinese-style classic egg rolls. I wanted to make my own that were spicy enough to need barely any dip on their own, just a dash of red wine vinegar and oil + some spices. Here’s my spicy egg roll recipe. 1 tablespoon of crushed red chili peppers (use less if you don’t want it spicy! In a large skillet, heat the oil and sauté the crushed garlic until fragrant. Add the ground pork and cook until almost browned. Add the shredded carrots, red chili peppers, green onions and cook until carrots are cooked. When the meat is browned and finished cooking, add the soy salt, white vinegar and salt. Continue cooking until the liquid is evaporated. Prepare a small bowl with a little bit of tap water. Preheat the oven to 450 degrees. Make the egg roll dip: Mix all ingredients together and whisk. 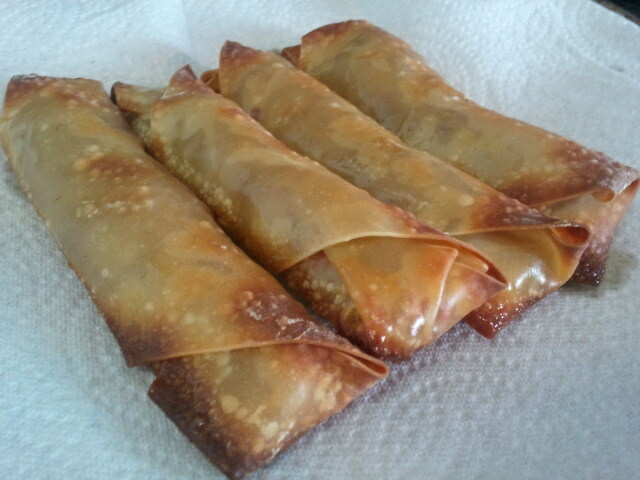 It will be separated, so mix lightly with a fork before dipping the egg rolls in it. Wait for the mixture to cool enough to handle, then scoop small spoon-sized amounts onto the center of each egg roll wrapper. Roll the wrapper around the mixture and dip your finger in the tap water. Rub the water along the edge of the egg roll wrapper to close it and make it stick. When you’ve filled all the egg rolls, line them in a greased baking dish with high walls and bake for 10-12 minutes, or until they are golden brown.